Considering the fact that tons of snow just got dumped all over the country, it seemed apropos to reach for a nail polish that really brought out the chill of winter. (In the best possible way, of course!) 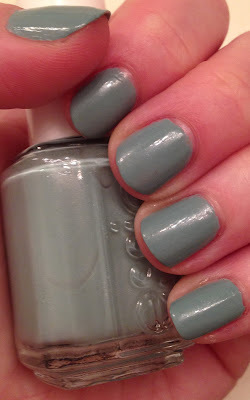 Enter Essie Parka Perfect. Parka Perfect is one of the colors from the Winter 2013 Collection. It's a beautiful dusty blueish green shot through with silver shimmer. In a word, it's ... perfect! Really, Essie hit the nail on the head with the name of this polish. The shimmer is just iridescent enough to add intrigue, while the color is a beautiful mix of blue and green that just feels absolutely right for cold winter temperatures. Essie Parka Perfect retails for $8 at beauty.com. It's a very calming color. I love it!